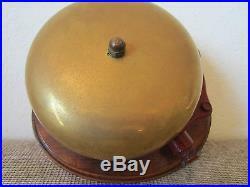 MARITIME BRASS TUG BOAT EMERGENCY ALARM BELL. 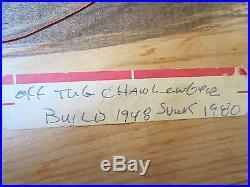 SALVAGED FROM THE TUG "CHAWLEWGEE". BUILT 1948 AND SUNK IN 1980. 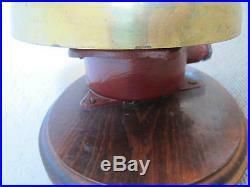 HAS SOLID BRASS BELL AND BRASS ATTACHED ELECTRICAL HOUSING. RAN OFF BOATS ELECTRICAL SYSTEM UNTESTED. BELL MEASURES 8"AROUND x 2"TALL. 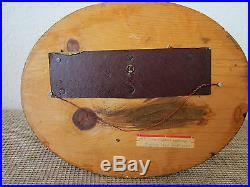 MOUNTED ON BOARD WHICH MEASURES 11 3/4"LONG x 9"TALL x 1THICK. OVER MEASUREMENTS 11" x 91/2" x 7. 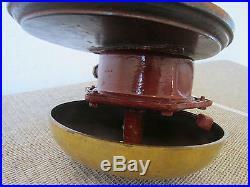 The item "MARITIME, TUG BOAT BRASS EMERGENCY ALARM BELL" is in sale since Wednesday, January 16, 2013. 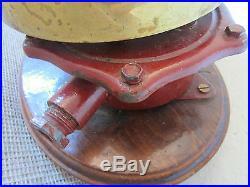 This item is in the category "Antiques\Maritime\Maritime Bells, Whistles & Horns". 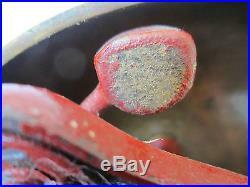 The seller is "uftd1463" and is located in Fort Pierce, Florida. This item can be shipped to United States, Canada, United Kingdom, Denmark, Romania, Slovakia, Bulgaria, Czech republic, Finland, Hungary, Latvia, Lithuania, Malta, Estonia, Australia, Greece, Portugal, Cyprus, Slovenia, Japan, Sweden, South Korea, Indonesia, Taiwan, South africa, Belgium, France, Hong Kong, Ireland, Netherlands, Poland, Spain, Italy, Germany, Austria, Israel, Mexico, New Zealand, Philippines, Singapore, Switzerland, Norway, Saudi arabia, Ukraine, United arab emirates, Qatar, Kuwait, Bahrain, Croatia, Malaysia, Brazil, Chile, Colombia, Costa rica, Panama, Trinidad and tobago, Guatemala, Honduras, Jamaica.